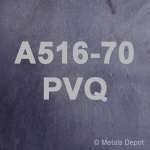 MetalsDepot® - A516 PVQ Plate | Pressure Vessel Plate - Buy Online! A516-70 PVQ Steel Plate aka Pressure Vessel Quality steel plate is designed primarily for use in welded pressure vessels where notch toughness or crack resistance is required. 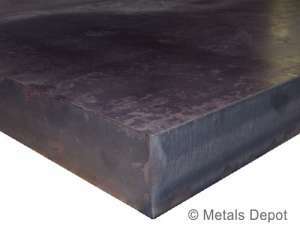 A516 Grade 70 is the most common high strength steel plate used in the construction of boilers and pressure containment fabrication and meets the quality standards set by the oil, gas and petrochemical industry. PVQ steel plate is easy to fabricate and welds securely while providing good corrosion resistance. Metals Depot stocks an wide range of thicknesses that can be purchased online in just the size you need. Give Us a call for additonal thicknesses, sizes and shapes. This product is provided in as-rolled condition, but normalizing is available upon request and by custom quote. Select ... 2 x 2 Ft. 2 x 4 Ft. 2 x 8 Ft. 4 x 4 Ft. 4 x 8 Ft. Select ... 1 x 8 Ft. 2 x 8 Ft. 4 x 8 Ft.